Well it has been a bustling year this one. I've just realized I took a tone of photos this year, perhaps even more than on previous years. Part of the reason was that I went to three major events where I took lots of photos, and partly because I bought a new camera with a cool new snap on lens. My anting year started with an unusually early war between two Tetramorium colonies. We had a warm spring and wet year so the ant activity was good this year. Here is a colony of Camponotus castaneus which seems to have moved on to a new location. I'm not sure where or why but one day they were there and the next they vanished. They didn't reappear at all later in the year either so that's a shame. I really like this species. The flowers in my meadow garden were the best they've been yet, and many of the species I've chosen secrete extra floral nectar. 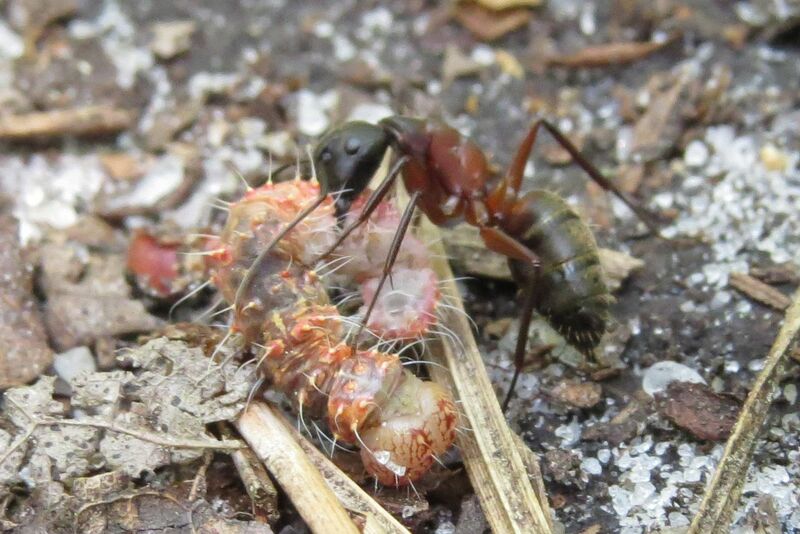 Here a Camponotus subbarbatus worker is nectar scraping. 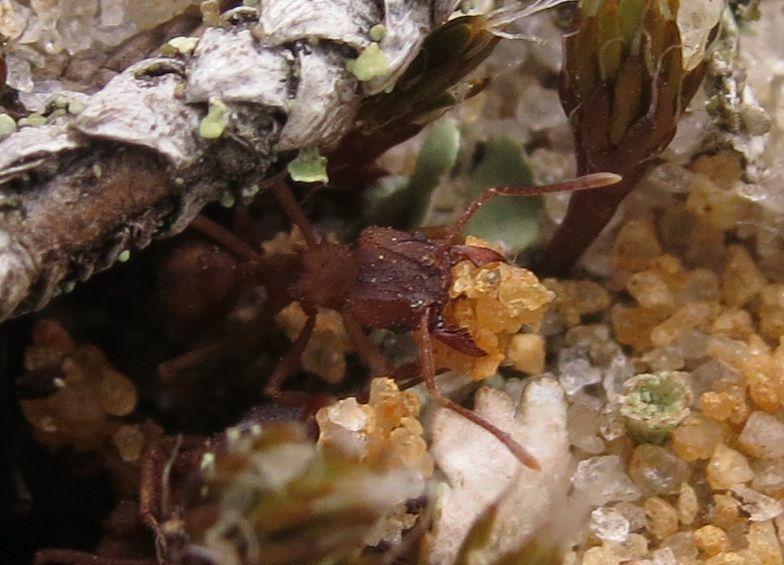 Basically they just run their mandibles along the surface of the bud to squeeze out what has to be only a surface thick layer of carbohydrates. You have to wonder if the nectar is worth the effort but apparently after a few hours of doing this they've collected enough to fill their social stomach. Eventually one of the major workers of the colony would check in on them and trophallaxis ensued. 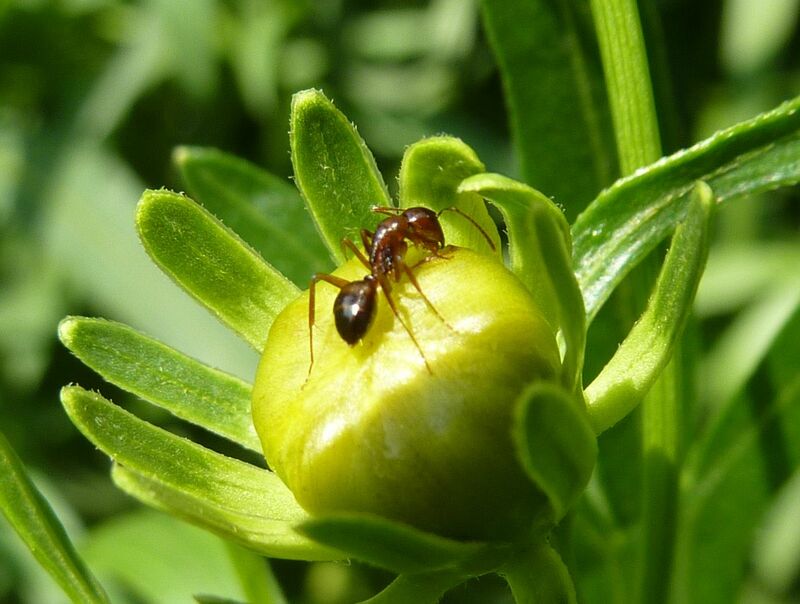 Major workers can hold more food so they're used mostly as storage ants. 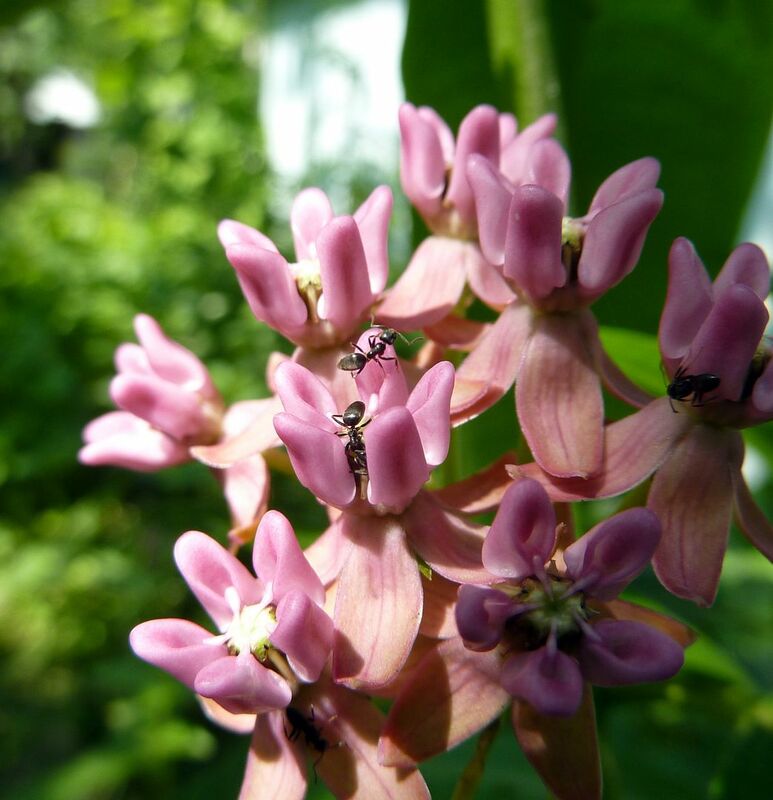 One of my rare plants, Purple Milkweed, Asclepias purpurascens, finally flowered this year... only to have it's nectar robbed by Odorous House Ants, Tapinoma sessile. This ant is hands down the most notorious nectar thief because this particular milkweed is covered in hairs along the stem which are supposed to secrete a sticky goo to stop ants dead in their tracks. No one told this species that because they robbed out all the flowers. Testing out my new camera I got an image of what I think is Lasius claviger. The hairs on the gaster are randomly spaced out and not in rows the way they are with Lasius interjectus. 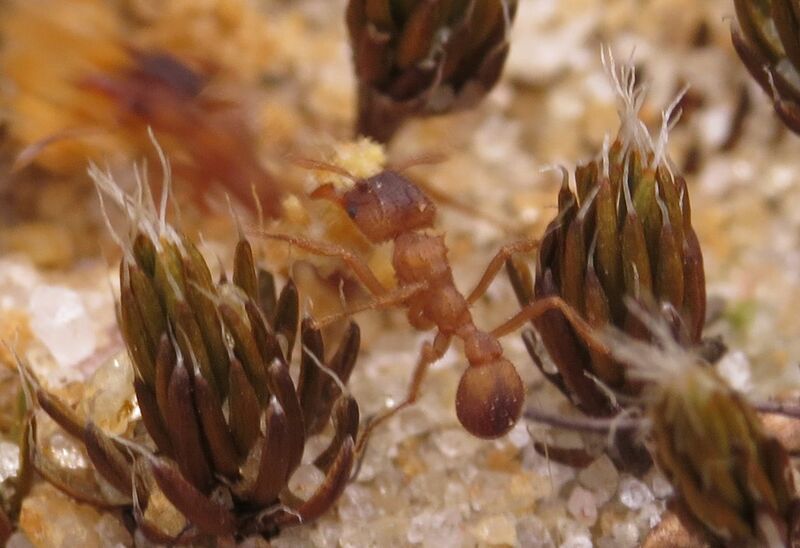 On the NJ Ant Together this year we found a few colonies of Northern Fungus Growing Ants, Trachymyrmex septentrionalis. They weren't very active so next year I'll try and hit the location sooner. There were a few out digging though. This was a test for me to realize just how varied one species can be. 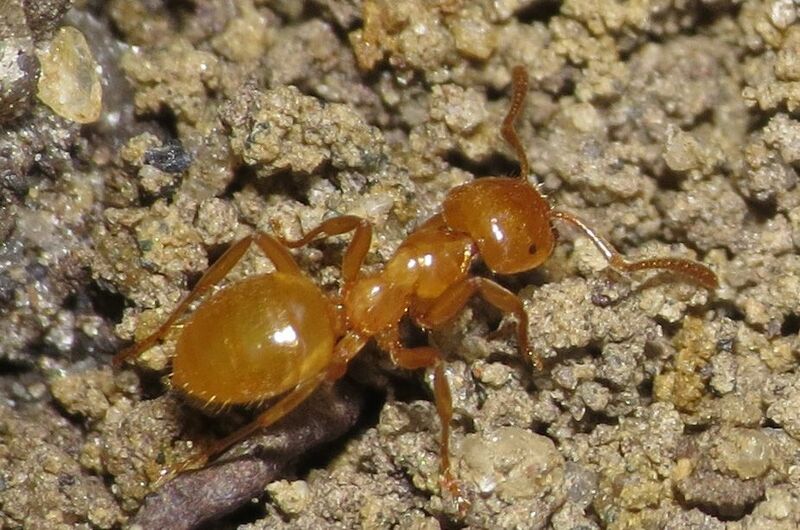 This is Formica pallidefulva which I have in my yard, but didn't recognize it here. I'm so used to them being a coppery brass color that it never occurred to me that there could be populations with such an abrupt color difference. I'm told they get even darker the farther north you go. Their cousins live in considerably larger nests. 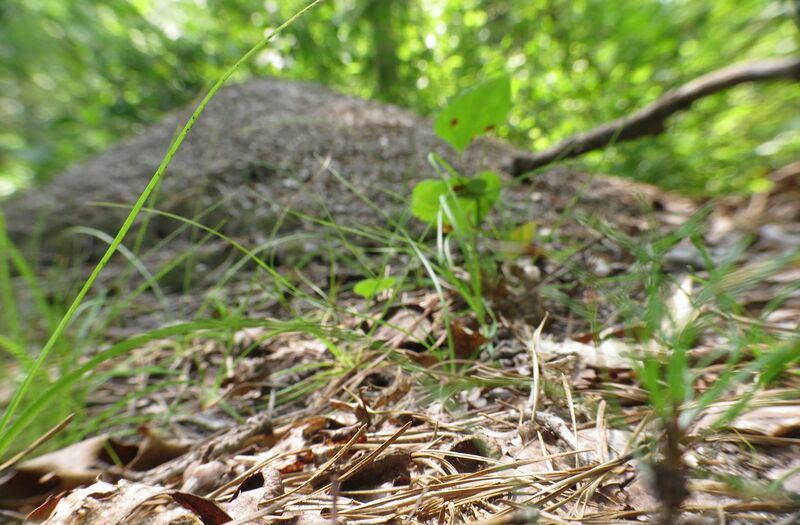 Formic exsectoides for small super colonies in relatively well preserved woodland areas. I think the only thing preventing them from distributing farther is their appetite. In the short while we were there we watched them haul in caterpillars, cicadas, and wasps. Anywhere that you stepped on the ground, because our shoes disturbed the colony scent on the ground, the ants quickly swarmed the location. It didn't help that there were so many running along the ground that we couldn't help but step on them, thus releasing alarm pheromone. 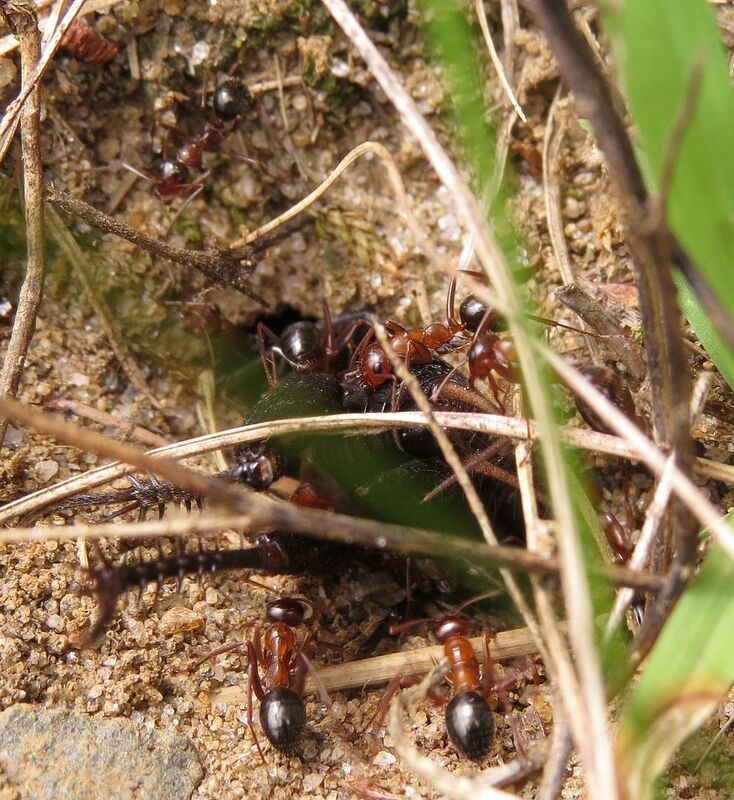 Outside of their range there were a few foragers of Camponotus chromaiodes. Note the pubescence on the gaster as well as the dark shoulders (which is only consistent on the larger members of the colony). 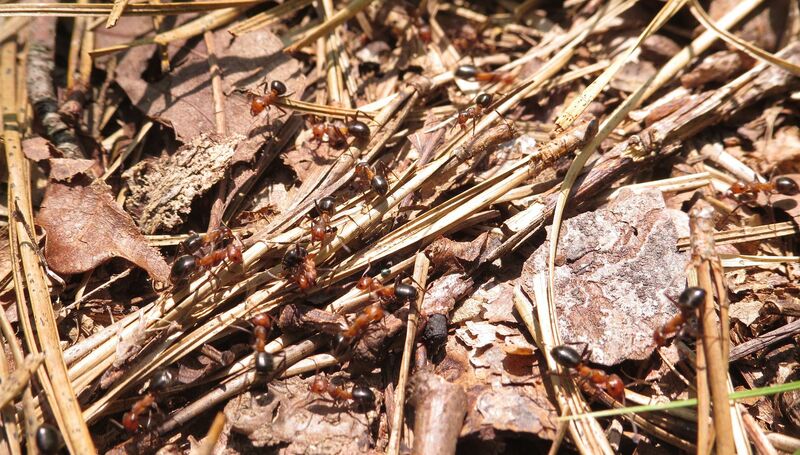 Formica forage during the day and the Camponotus take over at night. Crematogaster cerasi tending some sort of aphid which had a liking to this Rudbeckia flower. 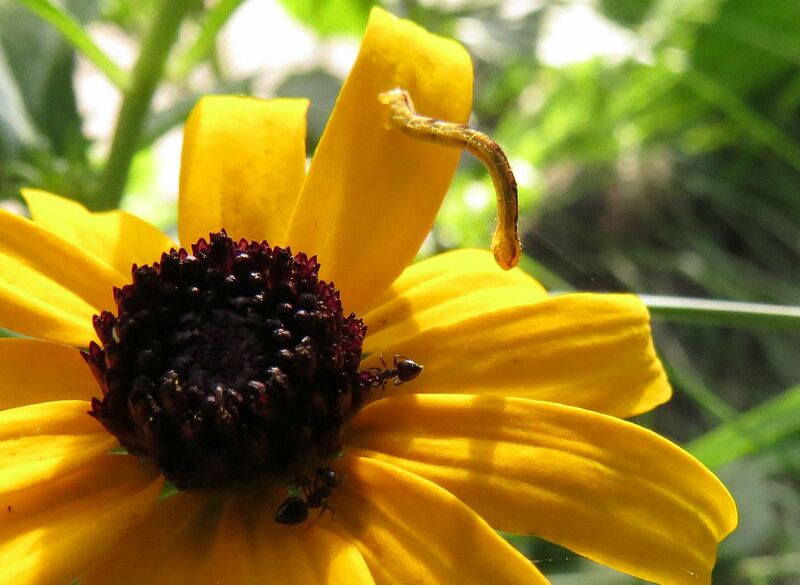 This was the first year I'd ever noticed aphids on Rudbeckia that weren't bright red and on the stems. These were actually green and some seemed to latch onto the seeds or various nodes where they were being developed. The caterpillar here is some sort of inchworm or possibly a looper. These normally feed on the flowers to these plants but was cautious about approaching this flower. 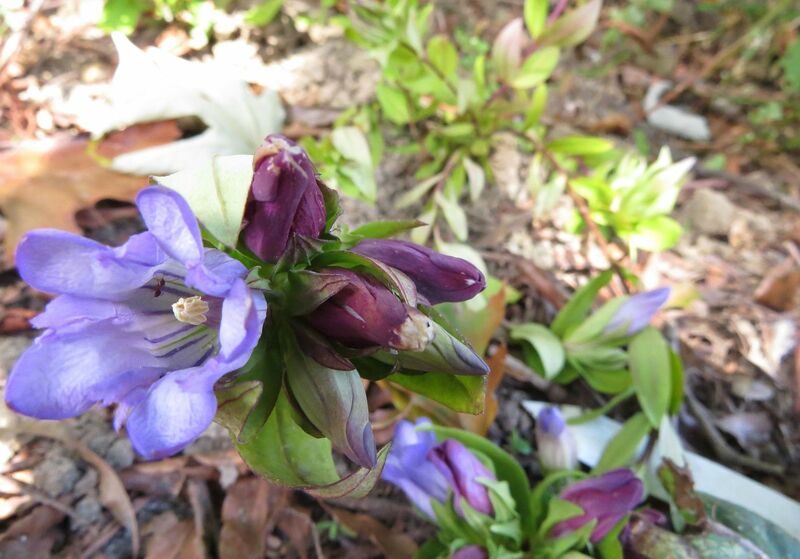 The last thing of anting for the year was observing another one of my rare plants Gentiana catesbaei. Other members of this genus keep the flower tightly closed and it's only through bumblebees forcing their way inside that they get pollinated. This species oddly keeps the flower open and invites everything on in. This also includes the ants. In this case it's the tiny Nylanderia faisonensis though they didn't seem all that interested in it really. just wanted to say how much I appreciate you writing this blog. I learn so much about nature just perusing through. Thank you! You're welcome. I love it when people comment here. Makes me feel like I'm not wasting my time.